Of Slab Edges……And a Trip Across the Pond! Welcome yet again my fellow friends of Hobbitton, to another edition of the Hobbit Hollow Construction Blog! Every once in a while, okay maybe at least 1 to 2 times a day, I wind up thinking of some quote from one or more of my favorite movies. I sat down at the computer and had in my head a different quote but wound up writing the one above. I had some guy drive by the house today while Terence and I were working. I don’t think this guy has ever stopped by, and I still don’t know who he is, but he went on and on about the house. At one point saying that I’m going to need to build a parking lot for all the people who want to come and see it. That’s encouraging! Maybe I was meant to build a Hobbit house after all! Had a tough week at work and not a lot of sleep. The first week of a new job is always a little stressful since there’s a lot going on. Anyway, I knew I wasn’t going to have the energy I needed to go at it this weekend. Of course I had also forgotten that Georgia was coming home Friday night and would be home Saturday as well. 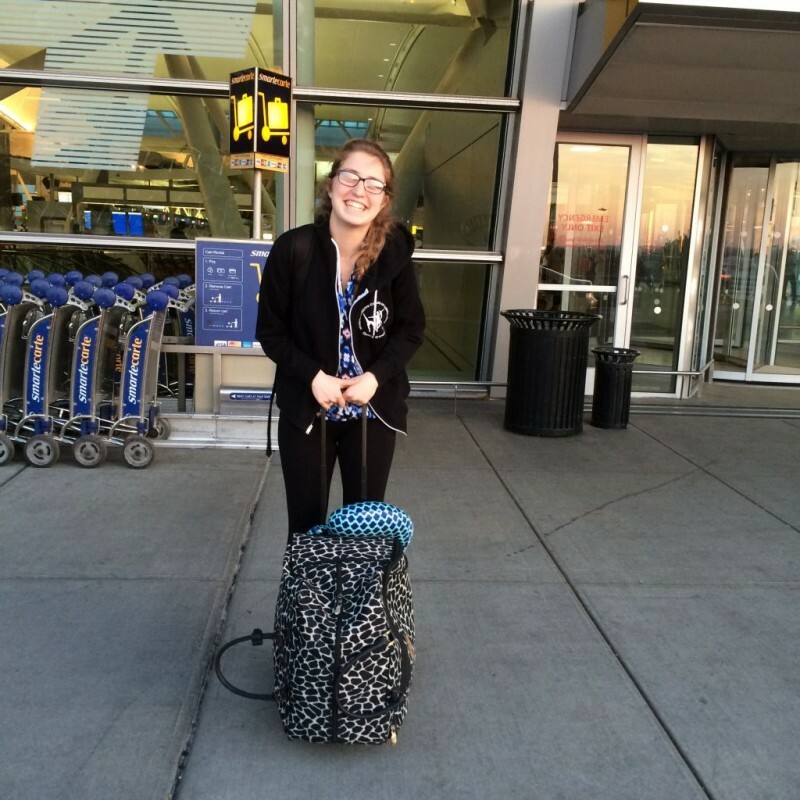 She’s going across the pond to visit a friend who is studying in England. I drove her to JFK International airport Saturday night. Traffic was a disaster. It took over two hours to get there. I have made it to JFK in under an hour with no traffic. Okay, that’s kind of fast but everyone drives fast on the Van Wyck Expressway. We got there with plenty of time to spare and she is now enjoying a stay in jolly old England. (Somewhere outside of London.) Have fun! Georgia at Terminal 4 at JFK. Leaving for England. Oh yeah. One other thing before we begin. 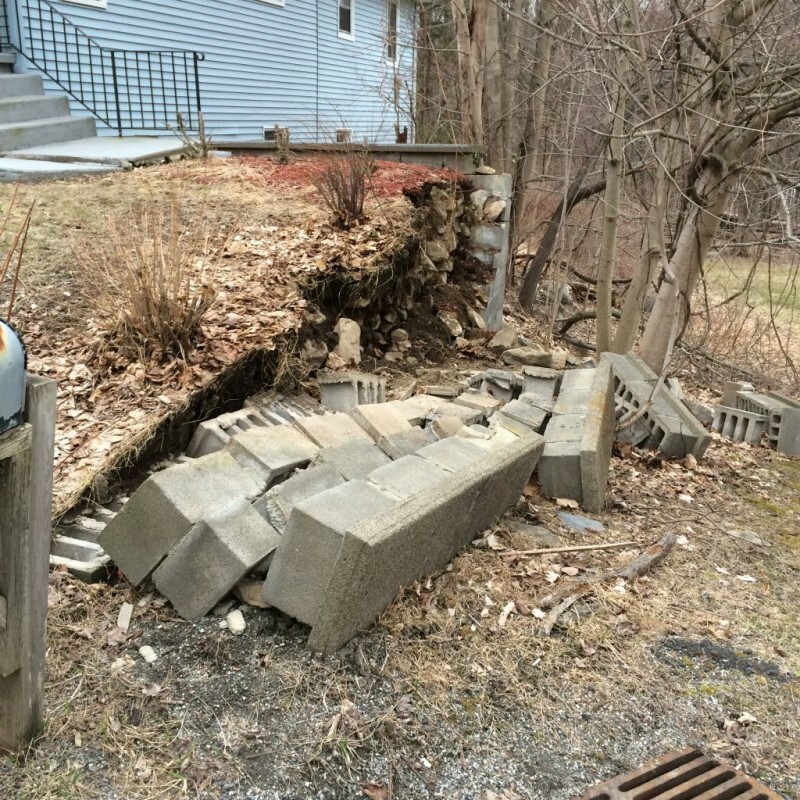 Mother in Law’s retaining wall collapsed last week. I always knew this was going to happen. It was just a question of when. The last couple of winter’s have been bad as far as the freeze/thaw cycle is concerned. I don’t know what some of these builders were thinking when they construct stuff like this. 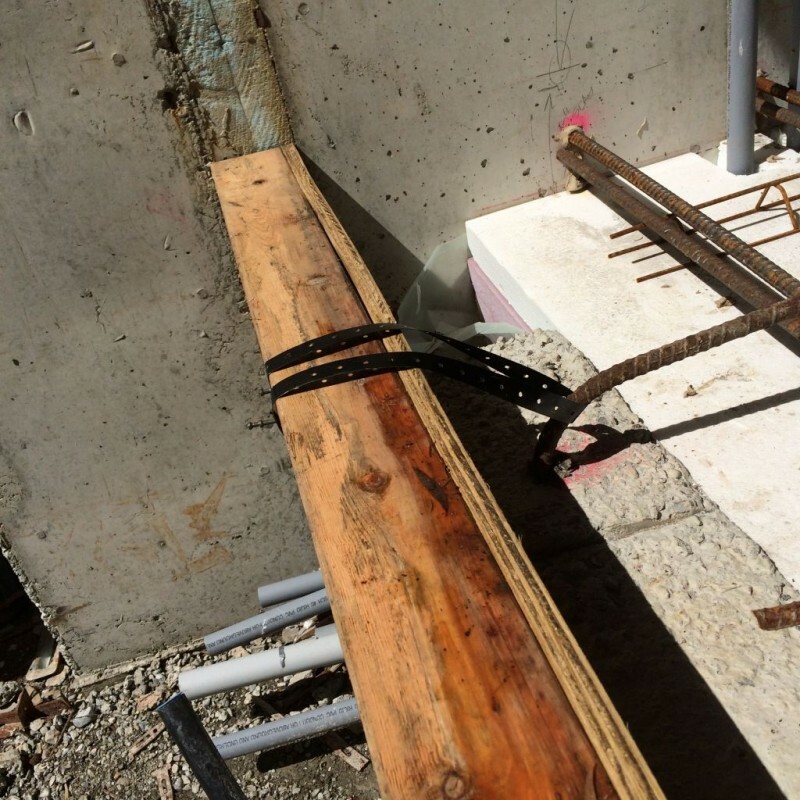 Okay retaining walls 101: You’ve got to have tie backs people! That’s the only way the thing is going to stay in place. This guy down the road from me had his retaining wall redone 4 times because he didn’t tie it back into the soil. I mean come on people. Find out why it went over already and fix it right the first time. Anyway, check out this mess. 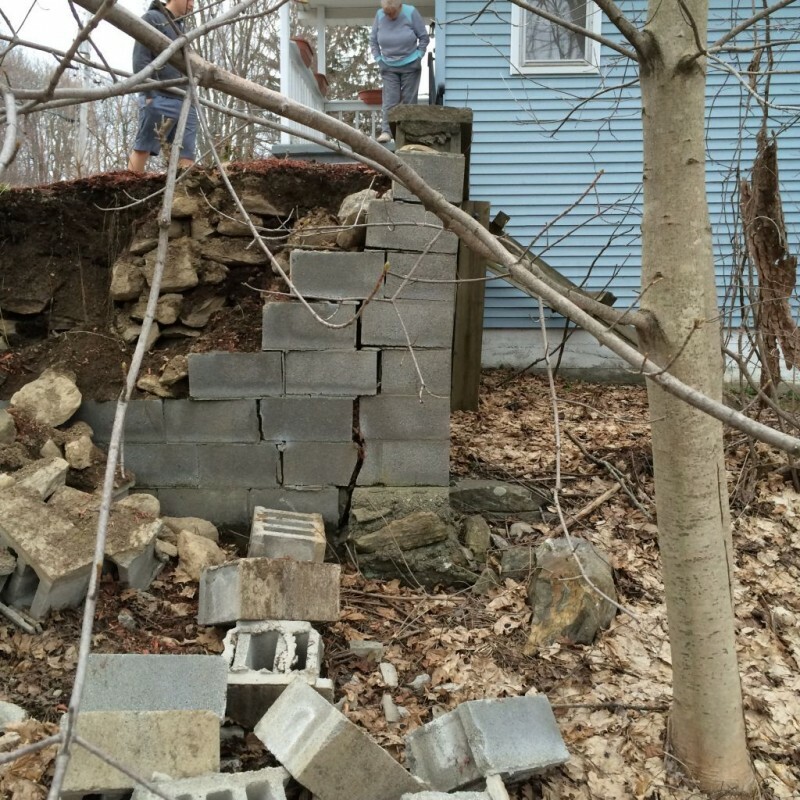 Retaining wall failure at Mother inLaws house. That’s my Mother in law there. She can’t go out her front door anymore because it’s too dangerous. We got her enough food for the week. I think she will be okay. We all know she has enough toilet paper for the next year and a half so that is not an issue. Just imagine….Mother in Law stranded at home. Visits to son in laws house will have to be postponed indefinitely. Hmmm. The Lord works in mysterious ways doesn’t he. My Father in law braced the larger portion of the retaining wall a few years back. That’s the only reason why the whole thing didn’t go down. I was kind of thinking that if we cut the top elevation down a couple of feet we might be able to use the left over super sod from Christmas as retaining wall material. Isn’t that what the Italians used as a footing base for that tower in Pisa? Hmmm. Maybe not such a good idea. So lets get back into Hobbit House construction shall we? Where were we anyway? Oh yeah, my Mother in Law is trapped in her house. Ooops. Just had to slip that in just one more time before we get started. You all know I’m writing with a smile right now. So the journey continues. Did a little general cleanup before we got set up. I’m still in shock seeing the good green earth again. Seeing the site without any snow is a beautiful thing. Eventually we set up and we got into forming the edge of slab for the up and coming slab pour. It’s a little tricky but Terence got the hang of it quick enough. 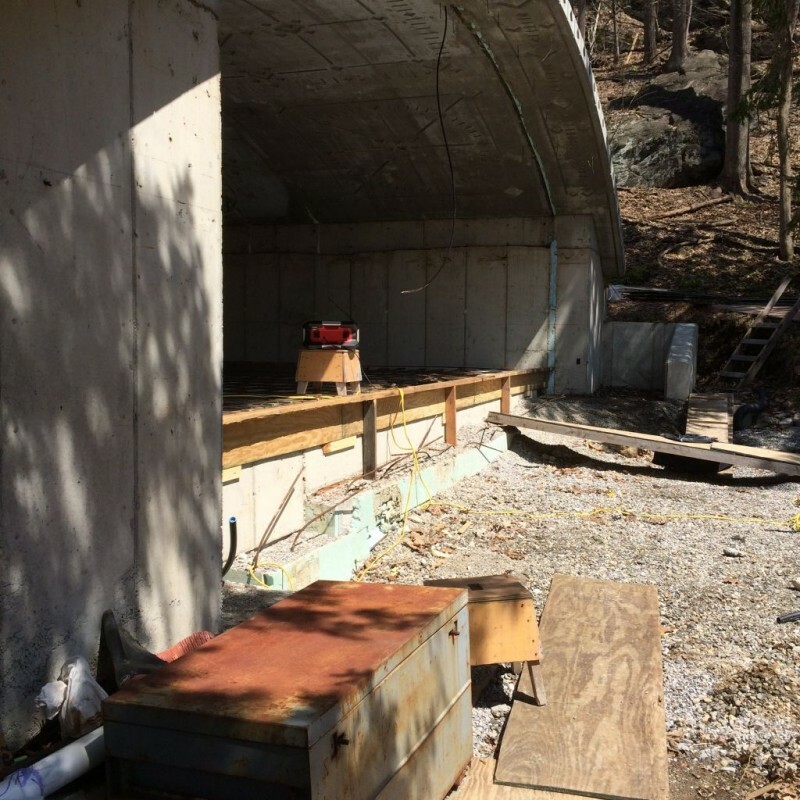 What I did was snap an 11 inch offset on the concrete wall below the top of slab. Once this is done all you have to do is secure a couple of cleats to support your 11 inch plywood putting them below that snapped line. Then all you have to do is sit the 11 inch plywood on top of the cleats and secure that to the wall. 1-2-3 done. Here’s Terence doing his thing. Terence installing the edge of slab form. So once you have the plywood up I put a 2×4 header on edge to help straighten out the form. The 2×4 joint should not be over the plywood joint either. So I used 12 foot 2×4’s on the ends and patched the middle. Once I had the header on I used a piece of my friendly neighborhood banding wire to secure the whole assembly. This way if someone steps on the 2×4 the form won’t bend over and fall off. It’s just an added precaution at this point but we will later use the banding wire to help us line up the form so it’s really nice and straight. Check it out. Banding wire wrapped around the rebar to hold the form in place. Speaking of securing the form I also added a couple of 2×4 supports underneath that header so if some fool really does stand on it his weight will be supported. I’m probably going to add a few more just to play it safe as well. Front slab edge form with supports. We did most of the back side as well and then we wrapped it up because I had to take Georgia to the airport. But we are definitely set up for a good day next weekend. Just a few added notes before I sign off. I called the Reeses Peanut Butter Cup Candy Company the other day. Turns out they have never delivered these beloved candies out to Long Island. (It’s true….who can blame them for not wanting to drive out there?) But it’s a crying shame, I know! I really do want the Long Islander to have a chance to experience a Reeses Peanut Butter Cup. At least before her 20th birthday! Jude told me she didn’t know what one was. Sad. Very sad. Just to keep things honest on the home front our stash of chocolate Cadbury Easter eggs was entrusted to Terence with the reprimand, “I want these out of the house! Share these with your friends at school!” The following day the Editor asks “Did you take those eggs out of your backpack?” “Huh…no.” “They’re going to melt in there if you don’t take them out.” Anyone getting a feeling of where this is going? Our boy genius did take them out of his backpack alright. Guess where our boy genius put the candies? It was 80 degrees outside the other day and I bet it was 95 in the glove compartment of the Editors car. She reached into her glove compartment to retrieve something and was wondering why someone had put a bag of warm water in there. 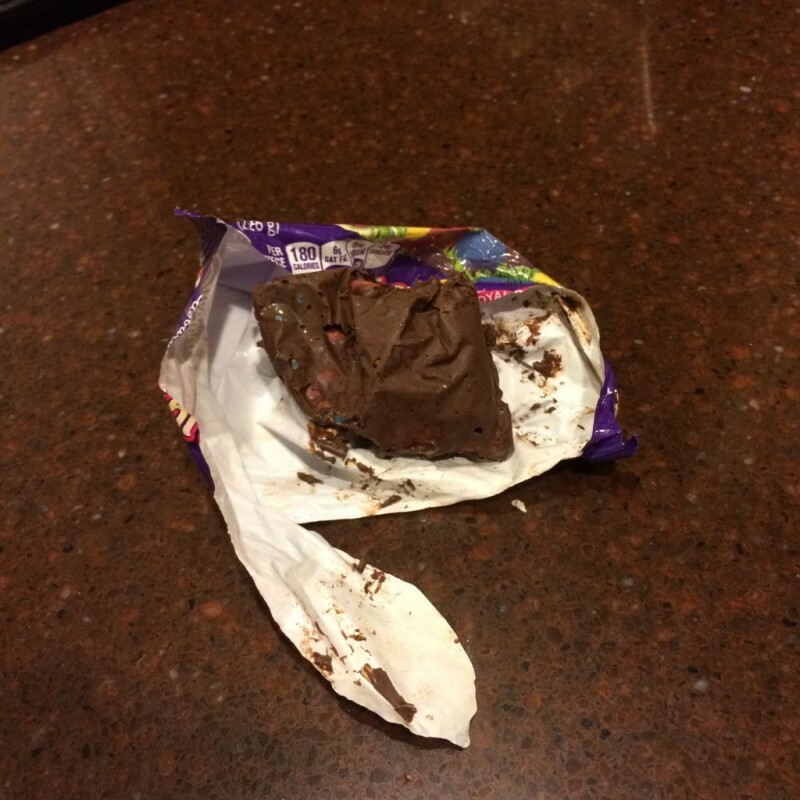 These poor little ole chocolate eggs….they never had a chance. This is the stuff I come home to on a regular basis. Of Electrical Panels….and a Trip to the Bronx….What Stinks? You see… I thought we were getting along swimmingly and then you had to go ahead and bring up my homeland. If you are going to comment my lack of Reeses, then please evaluate Dave’s choice of never watching the Lion King because he has gone so long without seeing it. Secondly, Irish candy trumps most if not all candies (reeses included); therefore, never had the need to have it. I am sorry that I have not commented in a while. Like yourself I too have been quite busy. Keeping Jude in check and away from cereal is not an easy feat! Casey: Just a few things, in no particular order. First, keeping Jude away from breakfast cereals ls actually quite easy. Just tell him Jaws is on TV and he’ll be gone in a flash. As far as Dave is concerned I wouldn’t even bring him into this ordeal. He doesn’t even know I’m building a Hobbit House. You are quite correct in the fact that Dave has also been deprived of a great many things in the movie department as well. Someday he’ll be explaining this to his therapist. But I digress. I can almost understand not eating a Reeses Peanut Butter cup, but a Snickers bar. That’s were I draw the line. This is almost analogous to Dave’s movie issues. We’ll talk someday I’m sure. Suffice it to say I wish you and all your college friends the best these last few weeks at school. I’m sure you are all going to do really well. PS: Do they go Trick of Treating on Long Island? Thank you! The luck will be greatly needed with exams coming. It it exciting to think that this school year is already coming to an end! On another note: Dave is a curious case for sure; some may even go a far as to say he is absurd (I do it all the time), but he’s a little bit of a nugget sometimes so we’ll keep him around for now. Anyway, Jude shares your feeling over the topic of snickers bars. I’m pretty sure he almost ended everything on the spot once I told him. Of course trick-or-treating was a thing on Long Island. October 31 is a date when children learn the important trade of bargaining. One snickers for two milky way bars and a kitkat was the best deal I have ever made. Could I have eaten the snickers? Sure, but why have one when you can get three? The only reason I wanted snickers in my bag was because of its trading value. You do like ice cream though? Don’t you? I mean that would really be huge if you didn’t. As far as exams go think of what Obi Wan said to Han Solo. “In my experience there is no such thing as luck.” I’m sure you will be ready and leave nothing to chance. We could probably write a book about Dave though. Something like…”Curious Dave and…” Maybe the Adventure to the Movie Theatre. That’s just for starters. The list could go on and on. As far as the Snickers trading is concerned: You’ll never get a Hobbit Hollow T-shirt trading in snickers. No exceptions…you have to work. Hey Mike! I think I have a whole house of John Kelly’s here. I think I’ll call them John Senior, John Junior, and Baby John. You can’t make this stuff up.